The Jute Panelled Carry-All is an all-purpose carry bag ideal for your day-to-day requirements. 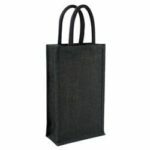 It is made from 100% natural jute and has two carry handles so that you can easily carry it. The front and back side of the bag has natural jute colour with gusset and the webbing handles in contrasting colours. With an overall size of 400 x 370 x 150 mm, this bag allows you to carry everything from books to groceries. You can use it as a giveaway item in departmental stores, shopping centres, library, exhibition, supermarkets, and more. 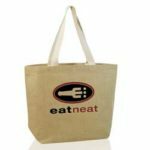 The Jute Panelled Carry-All is an ideal promotional item because of its utility and cost. The recipient will surely use it in public settings like a shopping centre, increasing the reach and recognition of your brand among the target audience. You can use the print space available on this bag to feature your brand’s name, logo, quote, slogan, message or custom artwork. Screen print method is used to print the selected promotional content. The price of the product includes the cost of one colour screen print in one position.